Residents and tutors of East Campus gathered yesterday to discuss the death of Richard Guy ’99, who died early in the day as the result of a drug overdose. “It’s hard but they’re handling it quite well,” said East Campus Housemaster Jed Z. Buchwald of EC residents. “There’s been deans on call, housemasters,” and mental health professionals on hand to listen to the students’ concerns, Buchwald said. “Things have gone about as well as can be hoped for right now,” Buchwald said. A student of East Campus found Guy unconscious on the fifth floor of East Campus’ east parallel yesterday morning around 1 a.m. Guy was pronounced dead at the scene. Guy, a resident of Mission Viejo, Californina, was entering his junior year as a physics major. The Cambridge Medical Examiner’s office confirmed yesterday that Guy died from asphyxiation as a result of nitrous oxide intoxication. Guy had a plastic bag over his head to inhale the nitrous. Guy’s death is being investigated by Campus Police. The death is currently presumed to be an accident. The Associated Press reported last night that the Middlesex County district attorney’s office said the case was not being treated as a homicide. During a meeting yesterday afternoon, housemasters and East Campus residents decided to move some of their in-house rush events to the halls of the dormitory in an effort to avoid media attention. Nitrous oxide, or laughing gas, is a common inhalant drug traditionally used as anesthesia. It is mixed with oxygen when used in anesthetic use, most frequently by dentists. Nitrous is also used to make large amounts of whipped cream and in auto racing. Pure nitrous oxide, however, can push oxygen out from the blood into the lungs, depriving organs of oxygen. It can cause dizzyness, light-headedness and euphoria. The possession of nitrous oxide with the intent of inhaling for intoxicating purposes is illegal in the Commonwealth of Mass-achusetts, with a maximum punishment of a $200 fine or six months in jail. According to the Massachusetts Department of Public Health, use of nitrous oxide and other inhalants peaks at eighth grade, with some experimenting as early as third or fourth grade. After the News Office formally announced Guy’s death, outside news organizations again descended upon the Institute. The death lead the newscasts on most local stations yesterday evening, with many media organizations quickly comparing the death with the alcohol-induced death of Scott S. Krueger ’01 at Phi Gamma Delta in Sept. 1997. Local media organizations were very interested in the story, the News Office confirmed. Also, about 4,000 of the 7,000 issues of The Tech printed yesterday disappeared from campus and were presumably stolen shortly after their 10:45 a.m. arrival, according to Satwiksai Seshasai ’01, Chairman of The Tech. The Campus Police have been notified and are investigating the theft, Seshasai added. Because of the incident, The Tech is taking steps to protect its distribution today, Seshasai said, declining to comment specifically. Yesterday’s death is not the first instance of nitrous oxide abuse involving members of the MIT community. In March 1984, Keith T. Ennis ’84 died at Tau Epsilon Phi after overdosing on nitrous oxide. The same year, five residents of Senior House were expelled for nitrous use, and two more were arrested by Cambridge Police for nitrous use. 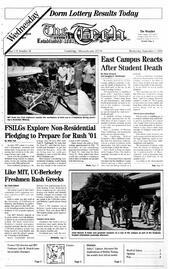 In 1988, Pi Lambda Phi was suspended from rushing freshman for violations including use of nitrous at a pledge party. In 1991, two electricians working at Lincoln Lab died after using nitrous oxide in their van.